The 18-hole Almaden Golf & Country Club in San Jose, CA is a private golf course that opened in 1969. Designed by Jack Fleming, Almaden Golf & Country Club measures 6900 yards from the longest tees. The course features 8 sets of tees for different skill levels. Greens and fairways are rye grass. The 18-hole Canyon/Mountain at Cinnabar Hills Golf Club in San Jose, CA is a public golf course that opened in 1998. Designed by John Harbottle III, Canyon/Mountain at Cinnabar Hills Golf Club measures 6617 yards from the longest tees and has a slope rating of 136 and a 72. The 18-hole Golf Club At Boulder Ridge in San Jose, CA is a private golf course that opened in 2001. 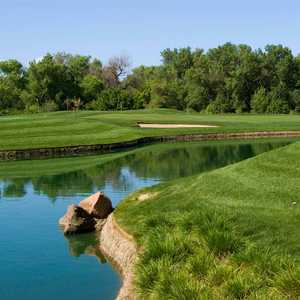 Golf Club At Boulder Ridge measures 6923 yards from the longest tees and has a slope rating of 141 and a 74. The 18-hole Lake/Canyon at Cinnabar Hills Golf Club in San Jose, CA is a public golf course that opened in 1998. Designed by John Harbottle III, Lake/Canyon at Cinnabar Hills Golf Club measures 6713 yards from the longest tees and has a slope rating of 140 and a 73 USGA rating. 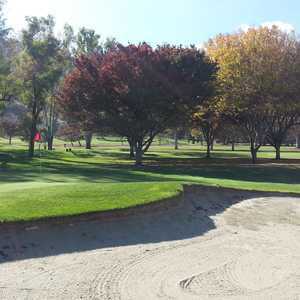 The 18-hole Los Lagos Golf Course in San Jose, CA is a public golf course that opened in 2002. Designed by Brian Costello, Los Lagos Golf Course measures 5393 yards from the longest tees and has a slope rating of 113 and a 65. The 18-hole Mountain/Lake at Cinnabar Hills Golf Club in San Jose, CA is a public golf course that opened in 1998. Designed by John Harbottle III, Mountain/Lake at Cinnabar Hills Golf Club measures 6854 yards from the longest tees and has a slope rating of 139 and a 73. The 9-hole Rancho del Pueblo Golf Course in San Jose, CA is a municipal golf course that opened in 1965. Rancho del Pueblo Golf Course measures 1338 yards from the longest tees and has a slope rating of 113 and a 35.5 USGA rating. The course features 2 sets of tees for different skill levels. The 18-hole Regulation Course at Santa Teresa Golf Club in San Jose, CA is a public golf course that opened in 1963. Designed by George E. Santana, Regulation Course at Santa Teresa Golf Club measures 6742 yards from the longest tees and has a slope rating of 126 and a 72. The 18-hole San Jose Country Club in San Jose, CA is a private golf course that opened in 1912. Designed by Tom Nicoll, San Jose Country Club measures 6225 yards from the longest tees and has a slope rating of 128 and a 70. The 18-hole San Jose Municipal Golf Course in San Jose, CA is a public golf course that opened in 1968. Designed by Robert Muir Graves, San Jose Municipal Golf Course measures 6700 yards from the longest tees and has a slope rating of 121 and a 71. The 9-hole Short at Villages Golf & Country Club in San Jose, CA is a private golf course that opened in 1968. Designed by Robert Muir Graves, Short at Villages Golf & Country Club measures 723 yards from the longest tees. Greens and fairways are blue grass. The 9-hole Shorty Course at Santa Teresa Golf Club in San Jose, CA is a public golf course that opened in 1996. Designed by Gene Bates, Shorty Course at Santa Teresa Golf Club measures 922 yards from the longest tees and has a slope rating of 113 and a 35 USGA rating. The 18-hole Silver Creek Valley Country Club in San Jose, CA is a private golf course that opened in 1992. Designed by Ted Robinson, Sr. , Silver Creek Valley Country Club measures 7000 yards from the longest tees and has a slope rating of 139 and a 74 USGA rating. The 18-hole The Ranch Golf Club in San Jose, CA is a public golf course that opened in 2004. The Ranch Golf Club measures 6656 yards from the longest tees and has a slope rating of 152 and a 72. The 18-hole Villages Golf & Country Club in San Jose, CA is a private golf course that opened in 1968. Designed by Robert Muir Graves, Villages Golf & Country Club measures 6630 yards from the longest tees and has a slope rating of 125 and a 72.